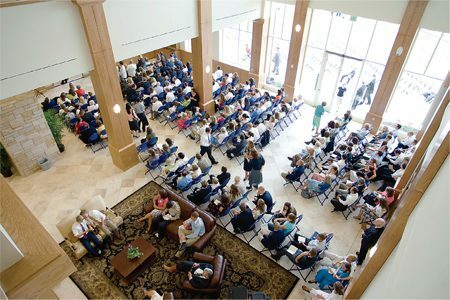 Just five days before the scheduled dedication, it looked like the new Gordon B. Hinckley Alumni and Visitors Center could not be ready in time. But that didn’t stop a small army from trying. Five days. 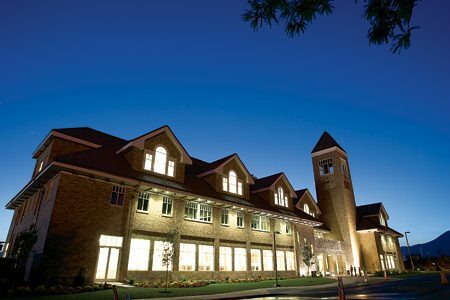 On Monday, June 18, crews had just five days to complete the construction, landscaping, furnishing, and cleaning of the 83,000-square-foot Gordon B. Hinckley Alumni and Visitors Center. On Saturday—only 120 hours away—dedication ceremonies featuring the First Presidency of The Church of Jesus Christ of Latter-day Saints were scheduled to be broadcast live from the building’s assembly hall. But on Monday the assembly hall was still a hard-hat zone. After a year of long work-weeks, the project came down to the final days and hours with contractors and BYU employees working side by side. “It was impossible,” recalls Kent Naylor (MBA ’00), project manager for Okland Construction, which teamed with Span Construction to erect the newest structure on BYU campus. 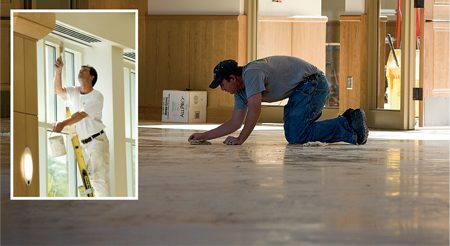 At the job site that day, Naylor found a daunting to-do list: The wood floor in the assembly hall was unfinished, pending the completion of electrical work, ceiling installation, and painting in the room. The front yard lacked sod and shrubs and a sprinkler system. The grand staircase needed woodwork and tile. The brick semicircular driveway was still dirt. And the second- and third-floor lights were at the factory—in Canada. When ground was broken for the building on President Gordon B. Hinckley’s 96th birthday, the plan included a 15-month schedule. In the project’s early days, however, it began to appear that the right effort, coordination, and weather could move completion up three months, allowing the dedication ceremonies to take place on the prophet’s 97th birthday. The new 12-month plan resonated with administrators, contractors, and donors. In the final days before the dedication of the Gordon B. Hinckley Alumni and Visitors Center, workers race to complete construction, landscaping, and finish work. Placing a Persian rug, created by six people working simultaneously for more than a year, next to buckets of paint in the middle of an active construction site isn’t the way McHood usually does things. But the project schedule demanded that subcontractors step over each other’s work instead of following one another in sequence, as is typical. The Hinckley Center family room welcomes dedication crowds only hours after contractors had finished their work. In the family work, alumni will relax with family and friends and participate in Alumni Association activities. In the Hinckley Center’s assembly hall, President Gordon B. Hinckley addresses those who gathered to witness the dedication and to celebrate his 97th birthday. Construction began with a ground-breaking ceremony only one year earlier—on the prophet’s 96th birthday. “For me,” says John C. Lewis (BA ’77), associate advancement vice president for alumni and external relations, “it was Thursday.” On that day—48 hours before the dedication—the commitment and dedication of workers was particularly evident, he says, and the finishing touches began appearing throughout the building. Thursday morning the long-awaited lights for the second and third floors arrived from Canada and the two crews of electricians—one per floor—challenged each other to a race to install them. Grounds crews carried endless buckets of mulch to just-planted shrubs. The contractors moved their last trailer out of the parking lot east of the building. Moving crews delivered 100 chair-filled boxes. And Thursday afternoon the doors to the assembly hall closed as workers began sanding and finishing the wood floor on which all those chairs would be placed for the dedication. The notes of a piano, echoing through the still-unfinished structure, brought a similar realization that this dusty work in progress would actually become the longed-for gathering place. 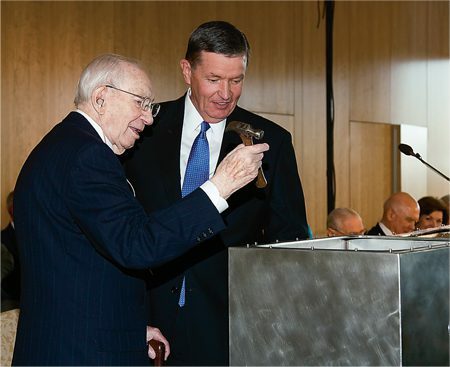 BYU president Cecil O. Samuelson watches as President Hinckley adds a hammer from home to the building’s time capsule, which will be opened in 50 years. Lewis remembers that moment as well. For him, that was when the building began to feel like a home. The notes of a piano, echoing through the still-unfinished structure, brought a similar realization to Palmer—this dusty work in progress would actually become the longed-for gathering place, a campus home for alumni and alumni programs. But much work remained. The piano tuners—two students from BYU’s piano shop—thought the finish on the two new Yamaha grand pianos was a bit dull. So 24 hours before the dedication, with Lewis’ blessing, they began dismantling the pianos and polishing them. Their work continued all day Friday, as did the work of many other crews. Woodwork on the staircase progressed. Touch-up painters worked throughout the building. Blinds were installed. Windows were washed. Lewis made a trip to Salt Lake City to retrieve a painting of the reconstructed Nauvoo Temple, which had been commissioned for the building and completed just in time. The paint was still wet when it was hung in the family room Friday evening. As the sun set on Friday, June 22, custodial crews from across campus mopped and wiped and vacuumed. Furniture movers did not leave until about 9 p.m. Those working on the displays were adjusting lights and placing books and pictures past midnight. The tile contractor set the last floor tile at about 4 a.m. When Lewis came back to the Hinckley Center at 7:30 a.m. on Saturday—five and a half hours before the dedication—contractors were just leaving the site. Set-up crews, who were asked to stay off of the drying assembly hall floor until 5 a.m., were walking around with protective white booties over their shoes, carefully placing chairs, risers, and lights in preparation for the ceremony. 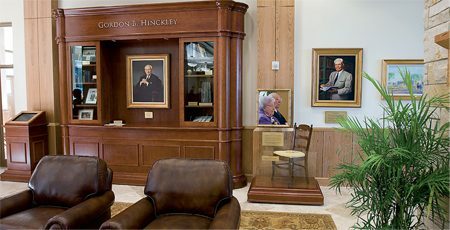 A small exhibit space in the family room displays some of President Hinckley’s books, a chair belonging to his wife, a portrait of his father, and other objects, all selected to help visitors learn more about the man for whom the building was named. Alumni leaders hope the building’s name will encourage BYU graduates to emulate President Hinckley in their efforts to be ambassadors for the school and the Church. 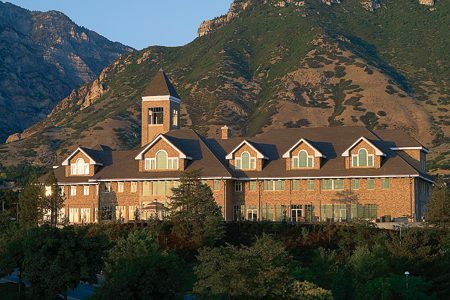 By the time the members of the First Presidency stepped out of their cars on the brick driveway in front of the building—at about 10:40 a.m. Saturday—the Gordon B. Hinckley Alumni and Visitors Center showed little evidence that it had been a lively job site only hours earlier. Ladders and tool belts were gone. Orange traffic cones and wheelbarrows had been removed. Only a few subtle signs of construction remained: a faint odor of fresh paint lingered here and there, and a forgotten drill bit lay in the grass by the gazebo. But as President Hinckley walked around the building, pushing buttons on kiosks and inspecting display cases and photographs, everything appeared to be in perfect order, as if it had been so for weeks and had been tested a dozen times. Soon, guests began to arrive for the ceremonies. Among them were many who worked on the building. One construction worker bought a suit and got a haircut to attend the dedication. Some brought their spouses. None wore hard hats. 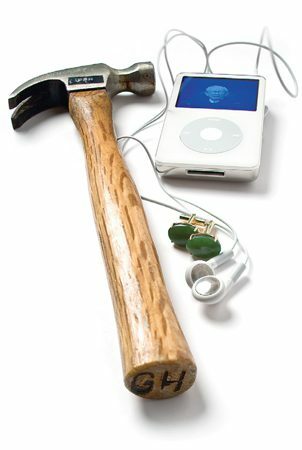 One of President Hinckley’s hammers and a pair of his cuff links join an iPod loaded with BYU video and other memorabilia in the Hinckley Center time capsule. 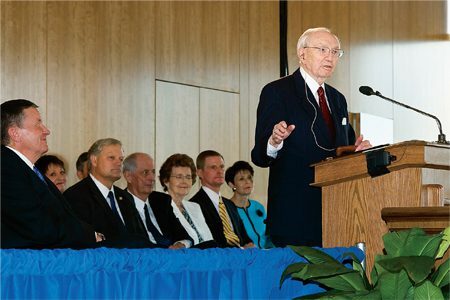 President Hinckley’s brief remarks preceded the dedicatory prayer, offered by his son Elder Richard G. Hinckley, a member of the First Quorum of Seventy. 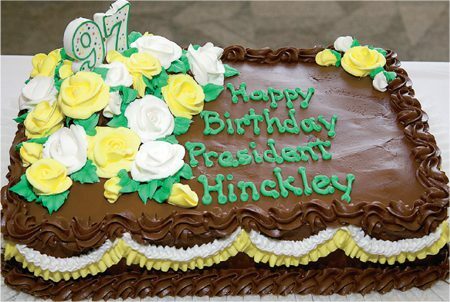 President Hinckley’s other four children, together with dozens of grandchildren and great-grandchildren, also attended the ceremony, which doubled as a birthday celebration. BYU presented the prophet with a birthday cake, and as the 900 guests sang “Happy Birthday,” President Hinckley waved his cane as if leading the music. The prophet’s optimism was reflected in the ambitious construction goal, and near the building’s large stone hearth, a stately bookcase displays some of his books, pictures, and awards. Against a pillar stands his shovel from home, a trusted tool he used for the building’s groundbreaking and gave to the university on his 96th birthday. Construction began on a Friday with a tool marked GBH. It ended on a Saturday with another tool bearing President Hinckley’s brand. And in the 12 months between, many other tools were plied in many other hands—often on Saturdays—to pay tribute to the owner of a shovel, a hammer, and a legacy of building. A list of the Gordon B. Hinckley Alumni and Visitors Center’s time capsule contents. Signed copy of Way to Be! While the façade may be stunning, the Hinckley is a true workhorse, serving as a home for alumni. BYU’s next-door neighbor is building up. Watch two new MTC buildings take shape in fast-forward.